Police in southwest China's Yunnan Province apologized after they used a childhood photo for a 17-year-old suspect in a wanted notice. 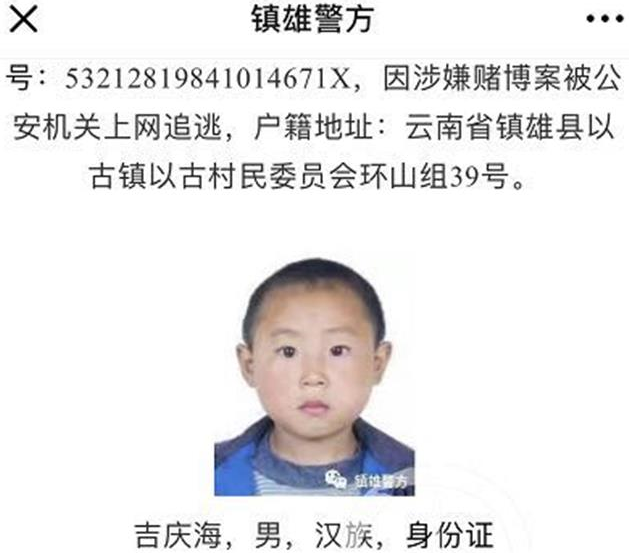 The purpose of a wanted poster is to attract public attention, but in this case the round-faced, chubby boy named as suspect Ji Qinghai appeared to be around 5 or 6 years old, and attracted more attention than cops had bargained for. Ji is among 100 suspects wanted by police in Zhenxiong County, Yunnan Province, for alleged gang crimes and other violent offenses. In an updated warrant issued Wednesday, Zhenxiong police replaced with the boy’s photo with a blank space saying a current photo was unavailable.